Affiliate linksBlush is a great way to perk up your makeup and shift your complexion from flat & tired to instantly luminous! One of my favorite ways to get a fresh, glowy look is to use a cream blush rather than a powder one. It’s easy to use (and blend), lets my skin shine through, and gives me a dewy fresh, natural finish! With my dry skin, cream blushes always work better for me than powder especially in winter. I like to use a cream blush directly over my foundation, set it with powder, and then add just a little more cream blush. The layering is key for a long lasting look! That said, cream blushes can be a bit tricky, especially if you have combination to oily skin. If you’re really oily, just make sure to use a primer and an oil-control setting powder and your cream blush will stay put much longer. Whether you’re looking for a natural glow or a dramatic flush, there are plenty of drugstore cream blush options to add a rosy glow. 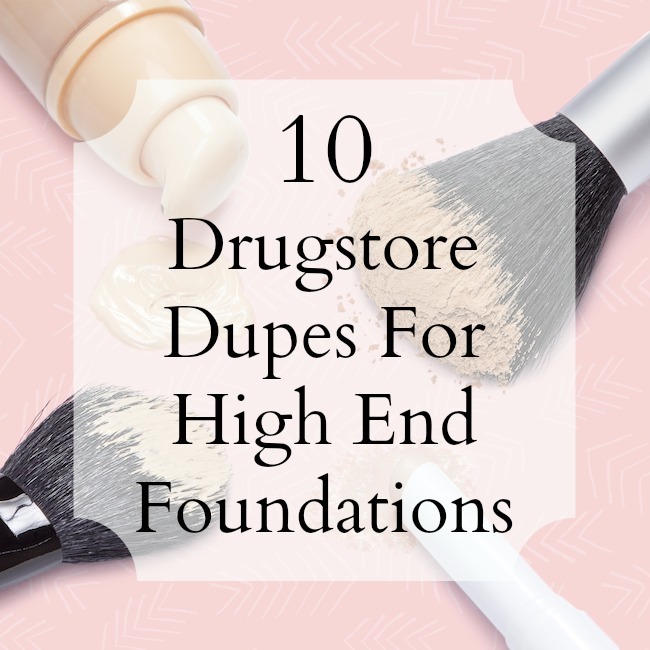 So just keep reading, and see my favorite drugstore cream blushes you’ll want to try too! Revlon Cream Blush ($6.22) – Revlon is one of my favorite drugstore brands, and this cream blush is truly one of their best offerings! The creamy formula blends very easily, adding a lovely flush of color to your cheeks with a soft, satiny finish. The colors are sheer but the formula is super-buildable if you’re looking to pack more of a punch and lasts quite long, at least 5-7 hours for me. My favorite shade is Pinched that adds a pretty peachy glow without any shimmer. L’Oréal Paris Visible Lift Blur Blush ($7.95) – I love every single thing about this blush! The creamy formula is seriously pigmented and it’s got a fluffy mousse-like texture that just melts into your skin. A little bit of this stuff goes a long way! It really does help blur dullness and imperfections with a silky-smooth, shimmer-free finish. And the staying power is great too. I just wish they had more color choices! NYX Whipped Lip & Cheek Souffle ($6) – This is a new product from NYX cosmetics that’s totally worth trying out! This one also has a mousse formula that gives you a soft velvety matte finish, not sticky or greasy at all. These are highly pigmented and you really need only a tiny bit to add a soft, natural flush. And the color is pretty long-lasting as well! I don’t like it as much as a lip color but it’s great as a blush. My favorite shades are Berry Tea and Plush. Sonia Kashuk Crème Blush ($9.79) – Sonia Kashuk is another of my favorite brands that offers premium quality products with a totally non­-drugstore, chic feel! This crème blush formula glides on like buttah and makes my skin look radiant and fresh, never greasy. It takes just a little dab of this creme to give you a beautiful touch of blush with a smooth and natural finish. I love this one on all counts! The colors Rosey and Petal are right up my alley! NYX Rouge Cream Blush ($6) – NYX cosmetics are known for their rich, pigment-packed products and these cream blushes are no exception! I love the glossy cream texture of this blush that glides across the skin with ease and results in a sheer, radiant glow. It blends on incredibly smooth and the color holds up quite decently throughout the day. The shades range from peaches & pinks to red and bronze, some of which have light shimmer to give your look a little kick! Flower Beauty Win Some Rouge Some Crème Blush ($10) – This is a fabulous matte cream blush that melts onto skin with a soft powder-like finish, leaving you with a naturally rosy flush. I love how the texture is delightfully light and creamy without a sticky/oily feel and would be suitable for all skin types. e.l.f. Studio HD Blush ($1.20) – This one is such a fantastic little beauty steal for just $3! The lightweight, velvety smooth texture plays nicely with my skin providing creamy color with a nice, strong wear. Plus, the convenient pump applicator makes it so easy to control the amount of product you need. The formula has a rich color payoff and gives you the perfect soft, dewy finish which doesn’t accentuate larger pores and doesn’t look too shiny. This one is a no-brainer if you’re not comfortable fidgeting with brushes or application! Rimmel London Stay Blushed Liquid Cheek Tint ($8.97) – The lasting power of this blush is ah-ma-zing. No problem with it staying put almost all day long! It has a creamy mousse/gel like consistency that’s so easy to blend and dries down into a beautiful, natural-looking stain so you’re not left with a creamy/oily feel on your cheeks. And the color won’t transfer at all! Maybelline Face Studio Master Glaze Glisten Blush Stick ($4.99) – If no fuss application is your deal, Maybelline’s Master Glaze cream blush sticks are the perfect pick! You can just swipe ’em on and easily blend ’em out for a pop of sheer color with a soft glowing sheen. Jordana Color Tint Blush Stick ($6) – Another cream blush stick that I can’t get enough of is this one by Jordana! I love how it glides on and blends effortlessly adding a delicious wash of color for softly-flushed cheeks. It has a fairly sheer to medium color pay off that can easily be built up depending on how intense you want to go. The wear time is a little on the short side but they sure do come in an array of pretty colors, with something to suit every skin tone! For just $3, it’s really a cheap thrill! What’s your favorite drugstore cream blush? Do share your budget friendly favorites in the comments below!